I finally picked up my Tito, but I had to do it the expensive way and purchased a Coilfang Stalker and Lesser Voidcaller (aka the screaming shadow meanie) for 7k and 3k. I just haven’t had the time or inclination to run those two raids every week. I enjoyed the achievement quite a bit. Karazhan was especially fun since I had 5 toons that could clear it. SSC turned into a chore after the first week, though I sort of liked running TK. It was fun to figure out how to take out the different bosses on my toons, even though only my (blood) DK could clear the last bosses in either SSC or TK. So I haven’t blogged this before, but I had attempted getting this baby about 8 months ago, first on my Frost Mage, and then on my Blood DK. I didn’t have the gear + mad skillz to solo the guy before the nerf. But thanks to a tip from Tamer Liopleurodon, I found out that they made it so the boss is soloable. In fact, for many it’s probably easier to solo than to duo, as the insta-death mechanic is still around for more than one player. Cutest quest text eva? You bet! I went and cleared it in about 15 mins on my DK as I still knew all the tricks (protip: having an invisibility belt helps). 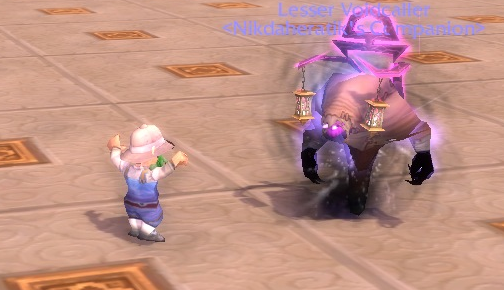 Then I tried it on my poor frost mage and he failed miserably. I had to tangle with two of the mini-bosses before getting to the last guy, and neither of them had even looked at my Blood DK. Of course, being a clothy makes it all extra annoying. And then I found out that popping mirror image actually turns the insta-death mechanic back on. And my poor clothy is too undergeared (and underplayed) to solo the guy without the images. 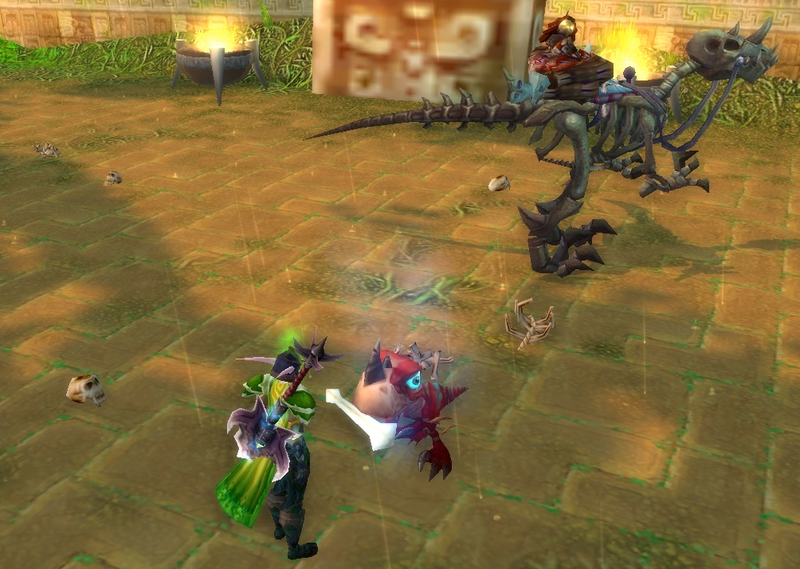 Still I got my pet, even if it was on the DK, and that’s the important thing! Yes dearie, I am your mummy! I did my 10 wins this past week, and I tracked the fights again, but haven’t done a writeup for it yet. I may or may not get to it before the weekend. Those posts take much longer than you’d think if you want to do it right. I’ve got another 10 or so pets to level 25. Including some I should have leveled awhile ago (like the Phoenix). I played with them some, but I’ve been playing with other games lately (sacrilege, I know) and haven’t done as much dailies or PvE battling. I always come back for more however, especially since the new patch looks to have alot of cool stuff! 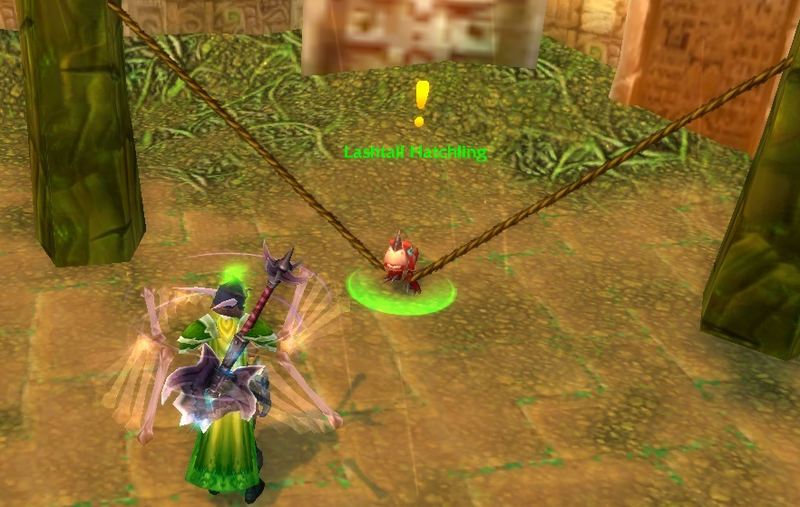 Anyone for Raiding With Leashes III ?? 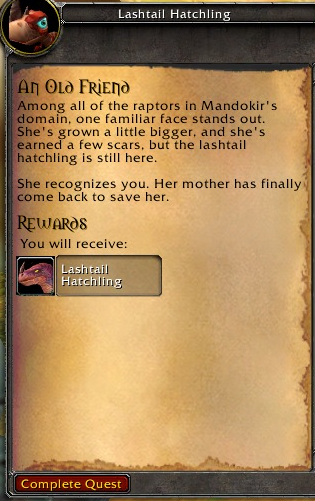 This entry was posted in Pet Collecting, Pet Notebook and tagged Lashtail Hatchling, Raiding With Leashes II, Update. Bookmark the permalink. 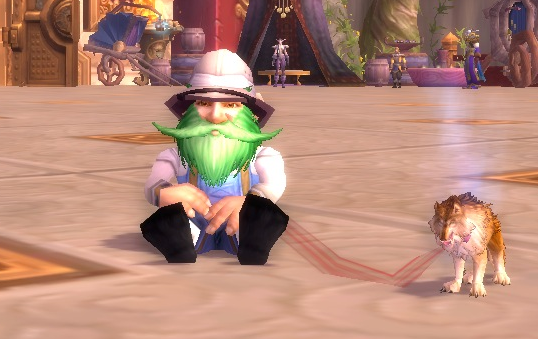 ← Pet Battle Notebook #2: I’m back!